The Daring Bakers did something a bit unusual this month– we baked lasange! Our hosts Mary of Beans and Caviar, Melinda of Melbourne Larder and Enza of Io Da Grande chose Lynne Rossetto Kasper’s (from The Splendid Table) Lasagne of Emilia-Romagna. This rich lasagna has layers of homemade spinach pasta, country-style meat ragù, béchamel and Parmigiano-Reggiano. OK, I know that photo is of my unbaked lasagna, but I confess to only having assembled it this afternoon. By the time we sat down for dinner, it was too dark for pictures, so this will have to do. 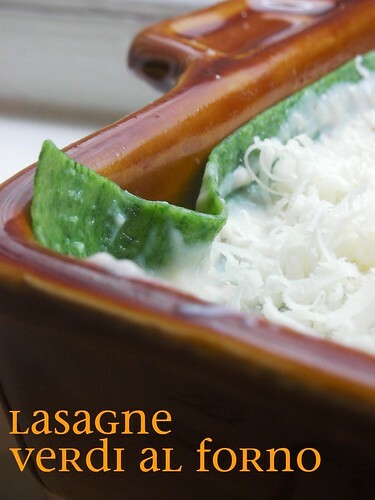 I make lasagne frequently, and I’ve made my own pasta on occasion, but I’ve never made spinach pasta (what makes this a “lasagne verdi”) before. Since I’ve already confessed to procrastination, I may as well get it all out in the open and also confess to laziness– I used some shortcuts when making the pasta. First, I used frozen spinach (thawed and squeezed well). Next, I made my dough in the food processor and then finished the kneading by hand. Finally, I rolled it with my pasta machine (taken to the thinnest setting) rather than with a rolling pin. Hey–it’s still handmade, if you ask me. The dough came together nicely in the processor. The egg alone wasn’t quite enough liquid to bind it, so I added a couple spoonfuls of the spinach-squeeze water. Let me tell you, the dough was a gorgeous green! I went with four layers of pasta in total, but I still had several sheets left over. There are so many things that can be done with extra pasta sheets (and I’m sure you’ll see that other DBers have made raviloi, manicotti, etc with their leftovers), but I’m lazy, ya know, so I just took a knife and cut them into thick “rags.” I’ll cook them up like regular fresh noodles and toss them with sauce later in the week. I’ve made béchamel (white sauce) a thousand times, and can probably do it in my sleep. It’s my go-sauce for things like mac and cheese and pot pies, so I had no problems there. I’m not one for making meat ragù, though, so this was new to me. I don’t eat red meat, and usually go vegetarian with pasta sauces. Here, I decided to swap out the veal, pork and beef in the recipe for a combination of spicy Italian chicken sausage (the raw kind for the butcher) and mushrooms (crimini and reconstituted dried porchini). I minced my onion, carrot and celery base in the food processor, and then did the same with the mushrooms. It made a delicious, thick ragù, and my husband, who certainly is a carnivore, thought it tasted great. This was such a fun challenge. Silky fresh pasta layered with béchamel, cheese and a tender ragù cooked down in milk, made for a very decadent, lush lasagna. Even though I made just a half-recipe (in an 8″ x 8″ baking dish), between the lasagna and the leftover pasta, I have a few nights’ worth of dinners for my efforts. That’s not bad at all! Visit Beans and Caviar, Melbourne Larder or Io Da Grande for the recipe. And check out the brand spankin’ new Daring Kitchen site– it’s gorgeous, and has lots of fun features to keep you entertained for hours! Thank you, Lisa and Ivonne!! Oh Lady Whisk…*bow* down to you. How beautiful the first picture is & am glad you had fun. I did too!! i used my pasta macine too, and i don’t feel guilty at all. of course it is still fresh, somebody had to be there to turn the crank!!! yours looks wonderful and sounds delicious. lovely green color lasagna sheets! great job! This was a great recipe, wasn’t it? A bit too much work for my liking, but the outcome was delish. Beautiful photos! Great job on your challenge and I do love the pictures you’ve posted up. I love the green color of your pasta! Looks delicious! I would love to have your version of the béchamel sauce — is the recipe on the website? Your lasagna is gorgeous! Look at the green color of those noodles! Great job. Very nice — wish I’d taken this opportunity to get a pasta maker…and on the left over pasta? I’m with you. Put it in a big bowl to enjoy. It was fabulous! Your lasagna looks wonderful! I love the picture of it coming out of the pasta roller. Yum! Your pasta is a beautiful shade of green! I bet the sausage was great. i did veggie but i loved the mushroom part so I bet I would love yours too. you lasagna looks great! Your lasagne looks beautiful! I love what you did with the ragu, too. Chicken sausage sounds great. Well done! YOur pasta looks great! I would have used a machine to roll it if I had one. so jealous that you have a pasta maker! i really want one. this looks awesome. the green color is cool! I love the green color of the pasta! I always forget to take pictures during the day and instead am left with poorly light shots. ohwell! I used a machine too and agree – handmade (I even employed child helpers ;-). Mmmm, this sounds so delicious!! Your pasta looks great, too. I love that bechamel is your go-to sauce. If I could pick a go-to sauce, bechamel would definitely be it–especially in the context of a good moussaka (something about cinnamon and meat…it’s a heady combination). I ALSO love that you used chicken sausage and mushrooms–that’s totally something I would want to sub. Sounds like we’re on the same wavelength!! Great job! Gorgeous lasagna noodles being rolled out there! I’ve always enjoyed reading your blog. Beautiful design and tempting photos. Thanks for the inspiration! (whisper) don’t tell anyone but I used forzen spinach too… ooops. And the pasta machine, that’s just smart! Tonights dinner then? Yum. I miss mine. Like you, I could make bechamel in my sleep – but the pasta? That’s another story. I have much to learn in that department. Ah it must have been the spinach water that helped contribute to your vibrant color! So beautiful and spring like. So smart to moisten your dough with some of the pasta water! And I would definitely say that your pasta is homemade even with the help of the food processor and pasta rollers. Mmm yum, the way you did this sounds delicous! Your lasagne looks gorgeous! 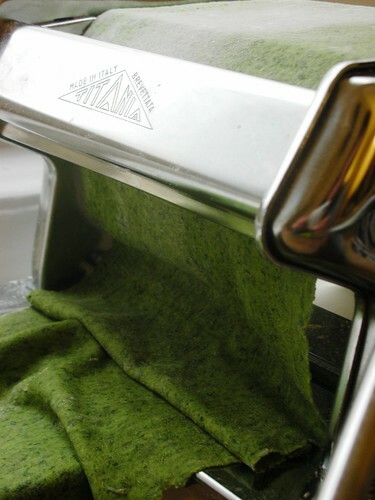 I love the photo of the pasta going through the machine—beautiful! What a gorgeous green color! It sounds like your lasagna turned out great. I salute all daring bakers for making this. 🙂 I love the colour and the dish. Keep it up all daring bakers. I totally procrastinated on this, and I’m glad that I’m in good company. Wasn’t this fun. Yours looks good even uncooked. I just love how green you got your pasta! I was tempted to use my processor too but decided to give it a try with my bare hands!! I really, really love how your pasta turned out! Your pasta sheets look beautiful! nice job on this challenge! I’ve seen quite a few posts about this challenge and I have to say your pasta looks wonderful. Great job with this. Now you make me wanna go back into the kitchen and do the challenge all over again! Great job on this challenge! And what a good idea to use some of your squeeze water to make the dough more moist. Mine didn’t taste very spinachy and I wonder if that would have helped. Well done. Great job on your lasagne!